This month I had a really tough time finding most of the April deals at CVS. Pretty much every store I went to after April 2 was out of anything/everything really good. Do not get me wrong, I did really well with other items (especially the M&Ms), but it was frustrating at times. I can only imagine the poor people that work at CVS who had to listen to people all month long about things being out of stock. Anyway Wednesday night we happened to be near a different CVS so I went in to see what they had. I have had luck at this one in the past. It was unreal – they had everything and tons of it (which when I went back today – was GONE). I was floored that they were overflowing with the 12 and 18 ounce Soft Soap Spa Radiant Body Wash. I quickly maxed out my limit on the 12 ounce and picked up two of the 18 ounce ones as well. They also had three of the rapid release pain relievers that fulfilled my limit. All of these items were FREE once I had my ECB print outs. In addition to this, the CVS I was at had a great sale on Tide Free. 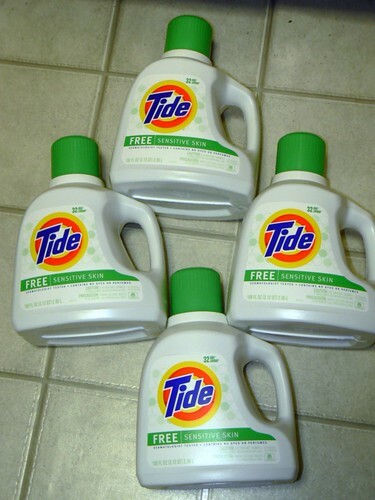 All Tide was BOGO along with the All detergent that was in the ad this week. Although I did not get ECBs for these, I still did great with coupons and the BOGO. 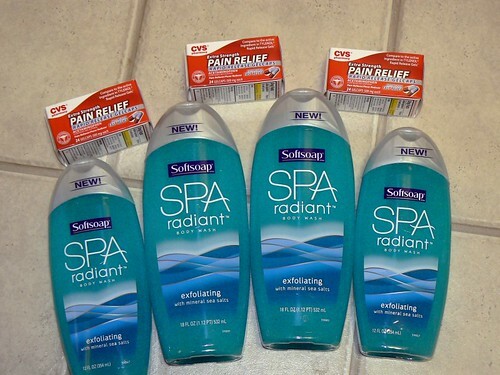 For all of the items below with a retail value of $64.89 I paid $2.78 out of pocket after coupons and ECBs. The best thing is I went in with $32 in ECBs and still have over $30! The next day (5/1) I made a trip to a different CVS. When I went to check out I found out they were not having a sale on Tide. Strange how some do things so differently so close to each other. I was upset for my mother who was with me to see how the CVS thing is done. During that trip I also received the May montly flier and was able to get the Colgate 360 toothbrushes (free after ECBs) and one other item to try with NHL when brushing his teeth. My mother had her own CVS card and I helped her with some coupons and was going to do her transaction. When her ECBs printed out I looked at it and saw MY NAME! Ugh, sure enough she had my small card. She has probably had it since I was in college. Problem was – we both were getting 2-3 of the Colgate 360 toothbrushes and could not do this on my one card. This threw me off my came and I had to think quickly. We filled out an application to get my mother her own CVS card and continued. I spent more out of pocket on my items because I was not able to use her ECBs that were mine . . . or maybe it was mine that were hers. You get the picture! My brain was mush at the end of that and I think the poor girl at the counter was too. We shall see what next week brings. Thanks to MoneySavingMom for her great scenarios and coupon alerts! Once again, you continue to amaze me with these deals! You go!! I understand sort of how this works, I know about the ECBs and everything, but how do you start? What is the very first thing I would need to do to start saving money like this? There are two CVS stores near my house so just tell me what to do! But veggie hot dogs sound nasty! No offense!